While pedicures do enjoy a summertime boom, they have become a year-round staple in salons across the country. They have become a necessity to some, a luxury to others, and a routine to still more. With such a wide variety of clients walking through your doors — each representing a different set of needs and expectations — why not tailor your standard pedicure to best accommodate them? Customizing will please clients and keep your service unique. A new generation of pedicure lines that incorporate intriguing all-natural ingredients — ranging from oatmeal and ylang-ylang to tea tree oil and sea salts — are giving clients and techs alike a new perspective on the pedicure. Suddenly, a pedicure is no longer a pedestrian service, but an opportunity for you to get creative, specialize your skills, and raise your level of service. Before you run off to experiment on your next pedicure client, remember that every pedicure must be built on a solid platform in order to ensure a thorough and proper service. Every pedicure, regardless of its purpose (pampering, necessity, or maintenance), must have a basic pedicure at its core. We asked L.A. Weekly’s 1999 “best pedicurist” SaVerne Smith of Taanasa’s Pamper Parlour in Inglewood, Calif., to guide us through the steps of her basic pedicure. 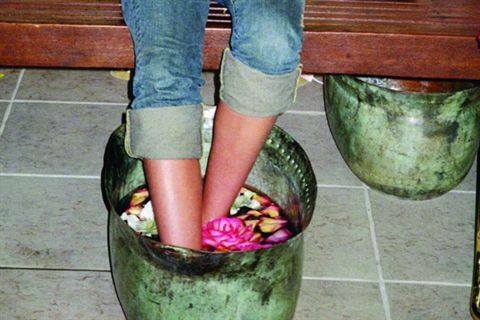 • Begin the service by soaking the client’s feet for a few minutes. SaVerne uses water that is as warm as possible and comfortable for the client. Opt for a salt, liquid, or gel soak to help soften rough, dry skin. • Exfoliate the feet and legs using an exfoliating scrub. • Trim and shape toenails. • Apply cuticle conditioner or softener. • Perform cuticle work and generously apply and massage in cuticle oil. • Apply callus softener and reduce calluses with a coarse foot file. Use a fine foot file to smooth and polish skin. • Perform a thorough foot and leg massage. SaVerne likes to use shea butter instead of lotion.To keep her clients happy she performs foot reflexology during this portion of the pedicure. • Clean the nail plate and complete the pedicure with an application of polish. With the basics in place the key is knowing your client’s needs and how to address them. Before starting each pedicure, examine the client’s feet and determine their state and where most of your time will be spent. Here we’ve outlined the general areas of concentration for feet in varying states of disrepair. Clients with neglected, dry, cracking feet pose both a problem and an opportunity. They require a lot of manual labor, attention to detail, and long-term care because of the volume of dry skin and calluses that must be addressed. However, they are perfect candidates for standing appointments for the same reason. • Focus on softening and moisturizing the skin. Specialized soaks, creams, oils, butters, exfoliators, and lotions will help make this step easier.“I start with a nice long soak — a minimum of 10 minutes,” says Michelle Smith of Nails by Michelle in Raleigh, N.C. Jill Wright of Angels Salon in Bowling Green, Ky., recommends using cocoa butter. Experiment with different products or whip up some of your own. Apply cuticle softener early to allow it to penetrate. • Reduce calluses.“I advise clients who need lots of work that I can’t do all the callus work at once,” says Annette Sather of JC Penney Salon and Spa in Madison, Wis. It is best for these clients to return for subsequent pedicures until their feet have been restored to good health. Lynette Madden of Salon 20 At Main in Pennsburg, Pa., agrees. “I tell my clients that the problem did not occur overnight and that we cannot rid them of tough, hardened skin in one appointment.” A good callus softener should be used and allowed to penetrate well. • Thoroughly groom cuticles as they tend to become very dry and thick when neglected. • Add a mask or peel. Masks are beneficial to dry, cracking feet because they are soothing and help to moisturize the skin.“I put on a cooling mud mask and wrap the feet in hot, moist towels for five minutes,” says Sather. Peels help to slough away layers of dead skin and allow moisturizers to penetrate deeper. • Dip feet in paraffin and wrap in warm booties.This therapeutic treatment helps to seal in moisture and leave feet feeling smooth and silky. Many different forms of paraffin are available — infused with soothing tea tree oil and vitamins, scented, and moisturizing. Select one that complements the rest of your service. • Minimize the massage time. If you have tight time constraints, deduct time from the massage portion first to be able to focus on tending to bigger concerns. 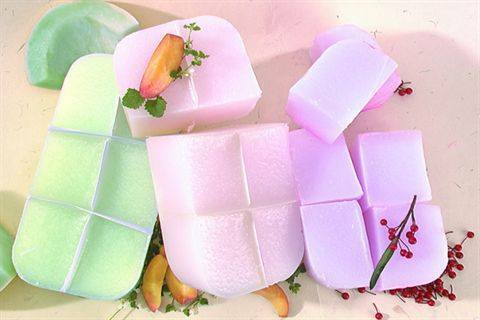 • Recommend at-home care.The daily use of a pumice sponge or foot file at home will help maintain the results. Not every client’s feet look like a train wreck. Those clients who come to you regularly or take good care of their feet on their own don’t require excessive amounts of work. It’s these clients who give you the opportunity to specialize your pedicures and get creative with your service. Because you spend less time reducing calluses, cleaning up cuticles, and smoothing rough skin, you can focus more on the feel-good, smell-good, look-good portions of the pedicure. • Perform a basic pedicure, addressing calluses, dry skin, cuticles, and toenails. • For clients with soft, healthy feet who are short on time or who just need to refresh offer them a mini-pedicure that includes a soak, file, massage, and polish. • Add something special to the soak: lemon slices, scented oils, milk, champagne, honey, fruit, tea, flowers, herbs. It will add a luxurious, personal touch to your service. • Offer specialty polish or nail art. Jewelry box nails, airbrushing, acrylics, gels, and French manicures are all good options. • If your standard pedicure does not include them, offer paraffin dips, masks, or peels as add-ons. Give your clients the option to dip their hands in the paraffin as well. • Rock massage is very popular. Incorporate heated rocks into your soak or use them during the massage. • In the down time during the soak or mask setting, offer polish changes on the hands. • Offer a neck and shoulder or hand and arm massage while toe polish dries. • For clients with dry skin or in need of extra pampering, offer a post-pedicure hot oil treatment. • If you have the facilities, offer a super-relaxing reclining pedicure. Clients will enjoy the total relaxation of this service. •Toe waxing gives a pedicure the perfect finishing touch.